Hotel Prielmayerhof is the ideal 4 star accommodation solution for your business or tourist stay in the picturesque city of Linz on the Danube River in Upper Austria. Housed in a stylishly renovated and modernized building, it boasts a prime location a short walk from the Linz Design Center - a modern multifunctional structure with impressive glass dome, congress center and spacious exhibition hall. The hotel is also within short walking distance from the central train station (Hauptbahnhof), the harbour, the State Theatre (Theater Eisenhand) and the Posthof. It is easily accessible from the A7 highway (Exit 10 is just 900 m away), 1.2 km from the atmospheric Old Town with its impressive main square - Hauptplatz, existing since 13th century and the St Trinity Column (Dreifaltigkeitssäule) - a tall Baroque column (20 m), carved of white marble and erected to commemorate the victims of plague and to protect the city from future disasters. Other important sights, which can be reached on foot from the hotel include the State Gallery (Landesgalerie), the 17th-century Old Cathedral (Alter Dom), the Castle (Linzer Schloss) and the remarkable 16th-century renaissance building of the Landhaus. If you prefer using public transport instead of walking, you can avail of the Garnisonstrasse public bus stop located right outside the property (bus lines 45, 46, 70, 71 and 73). The distance to the Hörsching International Airport is 15 km. The Prielmayerhof's restaurant offers a rich menu of professionally prepared regional Austrian cuisine, popular international dishes and a variety of quality drinks, especially red and white wines. Guests can have their food served in the restaurant's cozy salon or on its lovely garden terrace. Parking facilities of this 4 star city centre hotel include a paid private car park (€10.00 per day). Public parking space can be found in the immediate vicinity too and costs €1.00 per hour. All accommodations and public areas of the establishment are covered by free Wi-Fi Internet connection. Other service include breakfast buffet, breakfast in the room, room service, bar, 24-hour reception, elevator, air-conditioning system, garden, facilities for disabled people, safe, business center, bike rental and shuttle service. 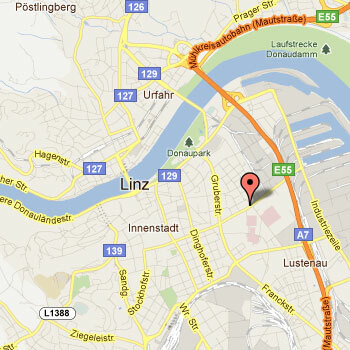 Hotel Prielmayerhof Linz has 73 spacious, air-conditioned and modernly designed guest rooms with en-suite bathrooms. They are all equipped with functional contemporary furniture and a wide range of amenities, including comfortable extra long beds, flat-screen TV, satellite channels, seating corner, free Wi-Fi access, writing desk, ironing facilities, telephone, radio, fax, in-room safe, bathroom amenities and hairdryer. Allergy-free accommodations and accommodations with facilities for disabled guests are available too.